How fortunate we are in Anchorage to have so much culture -- our Center for Performing Arts, which is located downtown (where you can still park on the street). In many cities, you drive 30 plus miles to reach the theatre, and then have to pay to park in a lot, if you can even find one, and walk some distance to the theatre. Sunday, October 28th, was the second performance of the season for the Anchorage Symphony Orchestra under the direction of Randall Fleischer. They played Bernstein, Milhaud, and Gershwin. But the star of the whole show was "Spontaneous Combustion", the World Premiere of Christopher Brubeck, son of Dave. The violin soloist was Nicolas Kendall, a dynamic young artist from the Washington DC area. They received a well deserved standing ovation, and humored the audience with a trombone and violin encore, of sorts. I want to mention to the Governor's Award Banquet in Fairbanks on Friday evening. Although the governor couldn't make it, the spot was adequately filled by Talis Colberg, our Attorney General, who gave a great speech. In Alaska, the Attorney General is appointed, not elected, and this was my first opportunity to meet him. The members of the State Council on the Arts were accommodated at the Fairbanks Princess Riverside Lodge, which is within spitting distance of the airport. They also housed many natives who were attending the AFN (Federation of Natives) convention, meeting at the same time. They had almost 300 people in attendance, and the elegant dress of the attendees did not include mukluks. If you want details of this event, click here. On a personal note . ..Flying Alaska Airlines to Fairbanks, the hostess spilled some coffee on me, so she's sending me some kind of voucher in apology, but the best apology was her giving me two extra packets of Macadamia Nuts. The return trip wasn't so lucky. We left 40 minutes late, and the 30 minute flight was 1 1/2 hours. When we landed there were emergency vehicles, blinking lights, red over red as the pilots say -- no, not that . . . but he did tell us after we were on the ground, that they couldn't get the landing gear down, so we had circled more than once before a perfect landing . . .. Here I am trying to lead a stress-free life . . .at that point, no-stress. These images do not do justice to the beautiful ice museum, which is located about 60 miles east of Fairbanks, Alaska. It's hard to describe the beauty of this famous new hotel.. . actually, it's not a hotel, as it doesn't have a sprinkler system. Being made out of ice, I hardly think there's any chance it would burn.. .maybe melt. Yesterday, my friend and I rented a car in Fairbanks to drive over to see this resort. More than one person told us, the drive was dangerous, the roads were icy, it's a long trip, etc. We found none of this to be true, and we made it over in an hour plus . . . however, we were almost turned away at the front desk (where you buy the ticket for the 'tour') because we were late for the 3 p.m. tour, and early for the 5 p.m. tour. Also, we were scheduled to fly back to Anchorage at 7 p.m. . . . not to worry. We spoke up and demanded attention, since we had phoned prior to the drive, and were told, "Oh, sure just come on out". . . We fortunately contacted the owner, who repeated the phrase, so we walked over to this cathedral-like building made of ice. Two men met us there, and one was the tour guide and the other the sculptor. Just opening the front double-doors flashed wonderment in our faces, for there was this huge, magical room the size of a cathedral with the path down the center, and lined on both side with sculptures. On the right was a cocktail bar with stools, and martini glasses, all made of ice (see image) lit from within, so made it more inviting than most bars. (well, except that it lacked some good jazz). On the left was the sculpture of a beautiful woman, motioning to us to come further. Then came the spiral staircase in a turret type set. However, it was closed because some woman had slipped on a step and injured herself while taking pictures. There were brick walls along the way, and then on the right was an igloo, about 20' diameter, with a table and chairs inside. Remember, all of this I speak of is ice! Then on the left were two life size horses, complete with bridle, reins, and ornaments, with the tail up in the air. Then on the right was a life size brown bear (ice, transparent, but brown here means BIG). Then came the bedrooms. Beautiful four-poster beds, with furs on them. This is for honeymooners, or anyone, actually. However, the 'guide' told us that most did not last the whole night there, and those who are checked in have another room waiting if they want to switch in the middle of the night. There was also a bathroom, with a toilet that looked real, but it was just for show. The whole thing was truly magical, and we felt fortunate to be able to view it by ourselves instead of a large tour group. It's an experience well-worth the detour if you are even in the area of Fairbanks. I just posted my image,that my artist friend took, but it's kind of dark. Anyhow, you get the idea. And finally . . . snow! The white cover arrived late this fall, but it did arrive. The weather is actually quite pleasant, and I've been saddened by the weather, wind, and fire of the San Bernadino area of California. It's so sad to see the beautiful homes and cars all burned and melted down. . . . this image was on the front page of the morning paper here, and I think it was great of photographer Marc Liester to have captured the moment at Kincaid Park. This is just a few miles from my condo, on the south side of the airport. Today we have a birthday party for the seniors at Pioneer Home that have had birthdays in October. I play the piano and my friend plays drums. Their chef makes a big sheet cake, and actually the food there is quite decent! Tonight the Convention and Visitors Bureau hosts an Evening Exchange at Mixx Grill. It used to be Mick's Grill, but chef Mick left, then came back. Construction around downtown, and midtown, is still going on like crazy, and yes, they do work thru the winter. I'll post an image of this one quite unusual building on Fireweed Lane when I get my digital camera out (or they put it in the paper -- easier). Until later, then . . . There's nothing especially to read on for -- I just wanted to apologize for posting the lyrics of the Shaker Song on yesterday's blog. You see, I was experimenting with things you can do from an html screen. It's just amazing, and I will never understand computers. I started taking computer classes over 20 yrs. ago, and learned DOS well enough to teach it at the University of Alaska Anchorage. I thought I was pretty smart, and loved email, and when the web came about, there I was. I was one of the first to 'do' windows, but missed the disk operating system. I guess I'm getting nostalgic, because I have spent the past few days throwing away my old notes and text books. Whoever thought they would be out of date. I hope I stay alive long enough to see what comes next. Maybe there will be a way to do my email from the great beyond. I think that PC's and Mac's work the same way when you're online. Well, to get back to the Shaker Song, I got the music from a friend (pirated?) the other night, and have been playing it, and singing it. You are spared because I don't think I can put a wave or midi file on my blog. Maybe I should try. Anyhow, it sounds pretty good to me, and I'll have to put it in my repertoire. Actually, I'm into novelty songs. One of my favorites is, I'm in Love with My Attorney Bernie. I also like anything Antonio Carlos Jobim wrote. Did you know that the "J" in Jobim is a soft "J" ... I only recently realized that, as I guess it's Portuguese. Well, here I am rambling on . . you can go now. .. bye . ..
Labels: Musings about nothing . .. This is an unofficial Jazz Week in Anchorage. The new Steinway Gallery hosted a most talented Russian pianist, Evgeny Chernonog, doing a recording session with two military musicians on the bass and drums. Kerry Maule, another talented horn player, had his group playing original compositions, which was also a first-class performance. I particularly enjoyed a female (!) on the French horn, playing jazz!!! Pictured, you see a giant fish which is one of 30 that were distributed around town for the summer season. 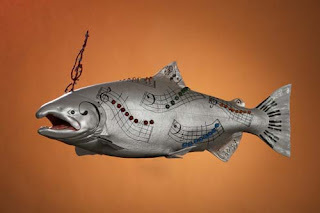 Each entry had to decorate a fish to a theme of his choice. This one shows the work of a delightful piano teacher, Julianna Osincek . . . she didn't win the contest, but her fish was my choice. They were all sold at a fund-raiser banquet recently. Anchorage has a lot of this type fund-raiser for non-profits. This Sunday is the annual Salvation Teddy Bear Tea, and I hope to get a good image of that one for you. Aside from that, the football season is in full swing, and UAA (University of Alaska, Anchorage) has started the basketball season with a great women's team, and a men's team that's trying hard to keep up. The weather in Anchorage is beautiful this time of year with the colorful leaves, and skies, and 'termination dust' creeping lower on neighboring mountains. (that's snow, in case you didn't catch the local terminology). . . This is my nostalgia page tonight, because I just returned from this video and talk on Charlie Parker, part of the Jazz Series at the UAA Library. There was a big crowd for tonight's feature, which was a film on Bird. Not Clint Eastwood's, but good, nevertheless. I had to think back to 1955, when I was teaching elementary school in Kansas City. Also, I was engaged to a popular disk jockey there, so got to all the parties for visiting musicians and other celebrities. Charlie Parker was not one of them, as he was a big name in New York City by then. His remains were only brought back for his funeral, which was a traditional funeral for a former native. At that time, they did not allow black musicians to perform in the city, so there was a club half-way to Independence, MO that we attended often, and I remember seeing Billie Holliday, Jay McShann and many others there. My, how times change. By the way, in my personal history, my girlfriend and I applied to teach in France and were quite excited to be hired by the Dept. of Defense to teach in the military school in Chateauroux. So I broke my engagement, and flew out of Kansas City forever. My girlfriend didn't, tho' . . . she married her sailor and lived happily ever after on Whidbey Island, WA. This is a beautiful time of year in Alaska, with the colorful trees and leaves. The sun has been shining, but it's pretty chilly out there. I put the title of my blog as one of my favorite songs, which I would like to play for you, but I don't think the blog space takes wave files. I'll have to look into that. 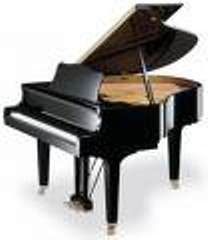 I am teaching piano, and in addition to that I'm involved in several other items of interest. If you're been reading my blog on a regular basis, you'll see I'm taking guitar lessons, as well. There's more, but it'll show up as my daily/weekly blog continues. 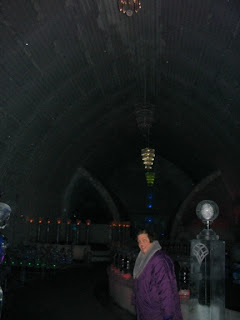 On Sunday, I visited The Dome, which officially opened on Monday, October 1, 2001. The write-up is in our paper today, which also has a video here. It's hard to believe anything can be so large. 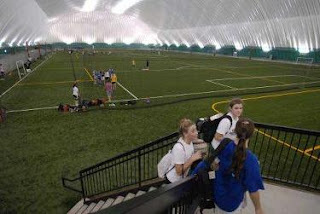 It's 290' x 680" long, and 87' tall, and will afford local sports teams year-round access to their sports, ie. soccer, football, track, baseball. It is actually a part of Changepoint mega-church. However, no church funds have gone into this structure, but it's all private donations and pledges. The Changepoint ministry itself has an interesting history, that you can read about on their site. There is nothing as beautiful as autumn in Alaska, with the colorful trees, and bustle of the locals getting ready for the long, cold winter. Plants come indoors, or get tossed. Winterizing means changing to flannel sheets on my bed, among other things. My personal goal this month is to build a great magic-show for the Hallowe'en season, and we're performing at the Library, to promote reading in general and magic in particular. So let's get going! When you live in Anchorage, it's not surprising to see moose along the road. They run into cars and eat the flowers you have hanging outdoors on your eaves. My friend, Dee Gould, snapped this picture the other day on Northern Lights Blvd. For readers who don't know Anchorage, it's our version of a "Miracle Mile". She's quick with a camera. Outside of this, I wanted to mention the great performance this weekend of Carmina Burana, which had over 200 people on the stage at the Performing Arts Center, plus a dozen from Children's Choir standing on 'orchestra pit' area in front of stage. It was quite dynamic and a great start for the Symphony season. The sun is trying to shine here, but so far we're surviving a drizzle. Think positive!